I am a girl that loves costume jewelry! I am alway on the hunt for statement pieces. I buy it when I travel, online, antique stores, boutiques or the mall. I always know the piece when I see it. 1. Sheer Addiction – It is created right around the corner in Hudson,Wisconsin. I love that she incorporates vintage pieces into many of the masterpieces, making them one of a kind. 2. Bauble Bar – Well, I am now on the wait list for this necklace…silver or gold. I should have ordered it the minute I saw it. 3. Alkemie– I have loved this line for quite some time. They use nature as inspiration for many of their amazing pieces. My next purchase will be the stingray cuff. 4. Kate Spade earrings – I have been searching for the perfect pair of green stud earrings. I think I found them. 5. 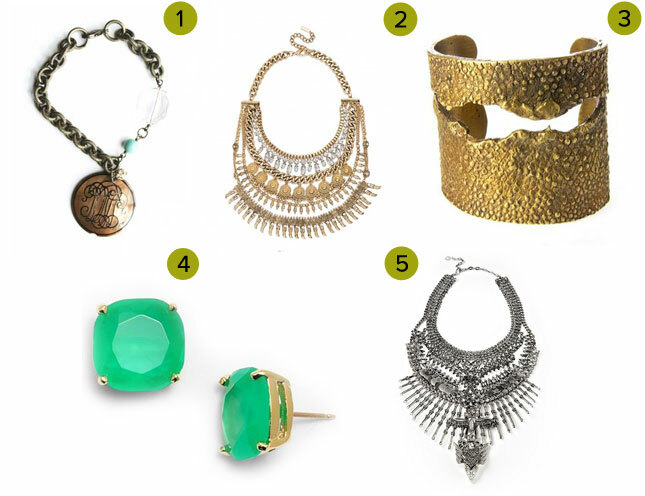 Splurge: Dylanlex necklace – I obsess over these amazing pieces! They are not cheap but what a statement.